What to look for when buying a dog water bottle? How do you get the dog to drink from the bottle? One great thing about having a dog is planning for adventures together! 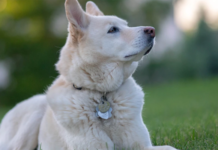 It is not only a great opportunity to bond with your pup and to make him or her happy, but it is also a chance to get off the couch for some fresh air and well-needed exercise. You can go for a hike, a day out in the park or for playtime at the beach – it all depends on where you are located and what opportunities there are. Regardless of how you choose to activate your best friend – there is going to be a need for fresh water! Investing in a proper water bottle for dogs makes it possible to bring fresh water no matter where you go, and a portable dog water bottle also solves the issue of having to stop and look for a place where your pup can get a drink. This dog water bottle with dog water bowl attached is FDA approved and made out of stainless steel and non-toxic silicone. It is a large yet light-weight pet water bottle that can be stored in a bag, the glove box of the car or clipped on to a belt (clip not included), and it is BPA and lead-free. The silicone tray allows you to easily provide your dog with fresh water when needed, and once you are done you simply allow the excess water to retract back into the pet water bottle, then detach the silicone tray and re-attach it reversed to the pet dog water bottle for minimal space occupancy. Why We Liked It – The design that allows you to remove the silicone tray and attach it upside down for easy storage and transport is what makes this doggie water bottle stand out! Extra plus points for its large size. 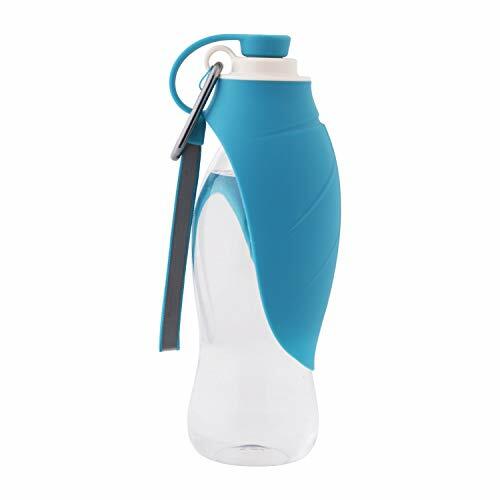 With a similar design to the SiRee dog water bottles, this product also has the function of being usable with only one hand, and water comes out with the flick of a button. However, this dog water bottle also has something that most other products don’t have – a filter! Fill up the outdoor water drinking bottle anywhere; in a lake, a stream, or even – believe it or not – a water puddle! The filter cleans the water and makes it drinkable for your pup so that you don’t have to worry about where you get his or her drinking water from. The carbon filter core should be changed every 2-6 months depending on how much you use it, and the product comes with one replacement. Why We Liked It – This is one of few products that have a filter to actually clean the water that goes down in the portable pet travel bottle, which means you can fill up these puppy dog bottles just about anywhere! Very convenient for long hikes and other outdoor adventures. 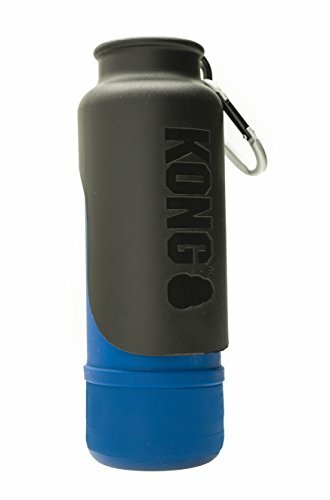 KONG is a brand known for durability and overall quality, and this pet travel bottle is no exception. The lid serves as a serving cup, and you simply remove it from the drinking water bottle for dogs, turn it over and serve fresh water to your thirsty pup. The stainless steel dog water bottle is insulated to keep the water cold longer, and it comes in 6 different colors providing you with plenty of options. The pet water bottle can hold up to 25oz and is ideal for medium- and large sized dogs, and it is a K9 water bottle that lives up to its promises. Why We Liked It – The insulation of this portable travel dog water bottle is ideal for hot days or long days out since it helps keep the water cool for longer periods of time. The SiRee doggy water bottle comes in two presentations – 12oz and 19oz, so that you can pick the size that best suit your puppy dog. It has a 30-day money back guarantee and a 12-month replacement policy, which makes this a safe bet when looking around for a portable water bottle for dogs in your family. It has a single-hand function so that all you need to do is squeeze the bottle for fresh water to come out, and release again for it to sink back in. This function helps to make sure that you don’t end up wasting water if your pup decides not to drink it all, and it therefore lasts longer without having to be refilled. Why We Liked It – Choosing the right portable dog water bottles can be hard, especially since many products are very similar in type. How to know if it’s the right product for you? This one gets plus points for having both a money back guarantee and a replacement policy in case something happens to the product. is a BPA free travel water bottle for dogs on the go, that weighs very little due to its patented design. All you need to do is to hold the pet water bottle upright and squeeze it with one hand to make fresh water come out and into the tray-like top, let your dog drink and then release pressure for the water to go back into the pet dog water bottle. dog water bottle for hiking and other activities can be easily attached to a belt or a dog backpack, it is dishwater safe and has a removable Velcro strap that can function as a practical handle. 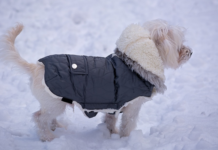 It comes in blue, pink and smoky gray so that you can pick a color that represents your personality as well as that of your four-legged friend. 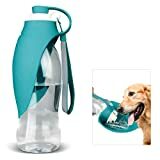 dog water bottle dispenser is easy to use since it only requires one hand, something that comes in handy (pun intended) when carrying other items when walking several dogs or in any situation where you might not have your two hands available. A dog hiking water bottle needs to be light-weight and easy to transport, and that’s exactly what this product aims for! It comes in two different sizes so that you can choose a smaller one if you don’t plan to be out for too long. The smaller size also makes a great puppy water bottle! The top; which is the “dog water bowl” the dog will drink from, fits most water bottles so it can easily be moved to a larger portable pet travel bottle for longer outings, or as your dog grows. The M&M portable pet water bottle is also dishwasher safe, which means it won’t be hoarding harmful bacteria, and it has a Silica gel seal ring to make sure it does not leak. Nobody wants water running down their leg if having a drinking water bottle attached to the belt, or even worse – soaked bags! Thanks to these features and the button that releases water – this won’t ever be an issue with this product. Why We Liked It – You might not realize how important it is to have a dog travel water bottle that does not leak until you’ve been down that road! There are few things as frustrating as a leaky water drinking bottle, and this product’s clever design eliminates that issue. Here we have another product with the design of having a lid that you can turn around to convert it into a dog water bowl. 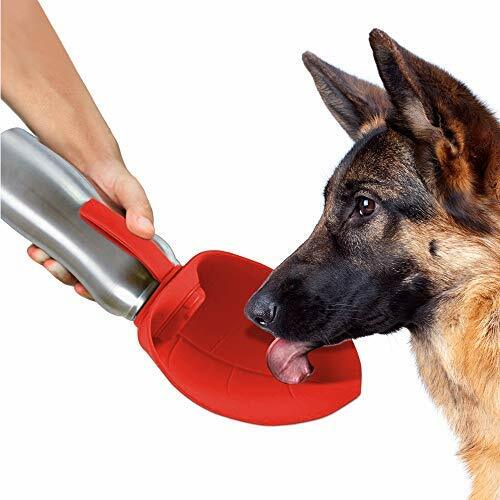 Just attach it backward and give your dog the drink he or she so desperately needs! This dog bowl water bottle is made out of stainless steel and BPA free material, something which gives you the guarantee of it being free from toxins and other things you don’t want your four-legged best friend to ingest. It can hold up to 25.5oz of water, which is more than many other similar products, but it is still light-weight and easy to take with you wherever you go. Water bottles for dogs should be durable, functional and affordable, and with that in mind – this is a great product choice. Why We Liked It – Simple and minimalistic water container for dogs, where you can choose from several colors! Pick the one that best fit your own- and your dog’s personality. It is also a great large dog water bottle due to its size. 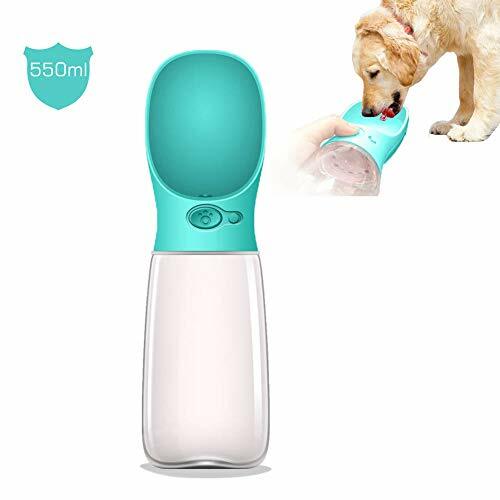 If you are not interested in any of the fancier portable water bottle designs, and you simply want a cheap and functional dog water drinking bottle for the occasional outing, then perhaps this classic design could appeal to you? 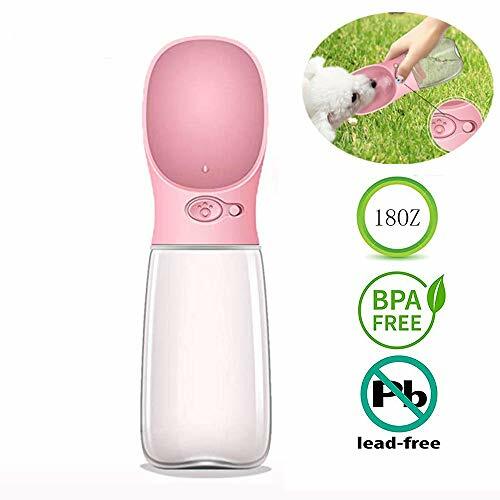 It is BPA free and safe to use for dogs, cats, rabbits, and any other smaller animal, and it has a simple flip function where you just flip the 11oz outdoor walking bottle from the dog water bowl and give it a squeeze for water to start coming down. It weights extremely little and attaches with a small clip to a belt, a bag or whatever you need it to attach to. The paw print and bone design are both cute and appropriate, and you can get it in either blue or pink. Why We Liked It – Sometimes it’s best not to overcomplicate things, and this dog water jug does exactly what it needs to do and just that – provides your furry best friend with water. It would be a great option if you are looking for puppy water bottles since it holds just enough liquid for a growing pup. 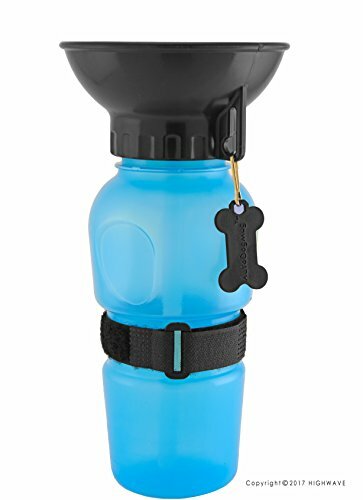 This dog drinking bottle holds up to 18oz and is great for strapping around your wrist, which you can easily do if attaching a strap, or you can hook it onto a backpack, a baby stroller, an extendable leash handle or a belt with the included clip. 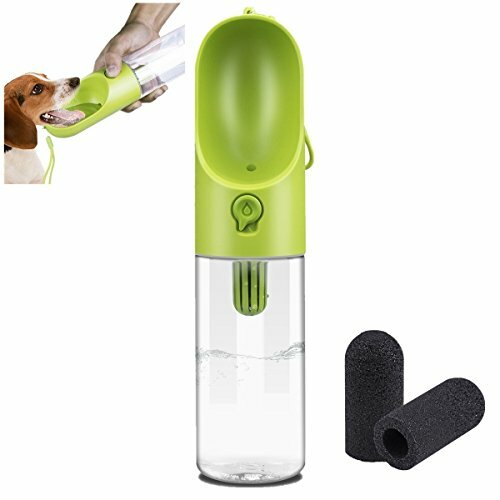 This portable dog water dispenser is leak proof, releases water with a simple squeeze and can be washed in a dishwasher for simple cleaning. Bacteria can start forming in moist environments, making it important to keep water bottles for puppies and dogs as clean as possible, which makes this a great option! Just pop it in the dishwasher along with whatever else and it will be ready to re-use in no time. + Simple and functional design. 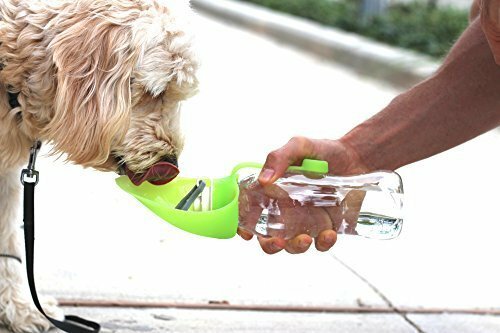 Why We Liked It – If you are looking for portable water bottles for dogs that are durable and simple in design – this water dispenser for dogs might be the water bottle dog bowl for you! A simple design with a bowl large enough for dogs any size – what’s not to like? An eco-friendly and 100% food grade water bottle for dog enthusiasts, that can easily be brought along on any dog appropriate adventure. Simply fill up the portable pet travel bottle at home, attach it to a belt or a bag with the included clip and get going! The water is released into the tray/bowl with the click of a button, and the container holds up to 18.5oz which is usually enough for most short outings. Only one hand is needed to operate this hiking dog water bottle, and it is easy to take apart and clean properly after use. Why We Liked It – This is a water bottle dog owners will find both easy to use and accessible in price! It has a simple design and a dog water bottle walking hiking aid big enough to hold the water needed for a fun day out! While this is not a dog walking water bottle – it is the perfect item to complete your collection of dog adventure supplies. If you are bringing portable water for dogs in the family; you might as well bring portable dog water containers as well, which can also be used for kibble! This product is made with dishwasher safe silicone and has a practical pop-up function so that you can collapse it within seconds and attach it to a belt or a bag with the included clip. It is great for filling up with water when you and your dog decide to take a break so that he or she can drink freely, or for being used as a portable food container. 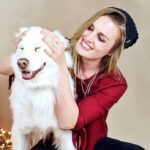 There are so many opportunities for fun activities with dogs, so much you can do that involves your furry best friend and so many great adventures that you both could embark on. Choosing the best dog water bottle is essential for a hassle-free experience, and also as a security measure since dehydration can be incredibly dangerous for a dog. Let’s have a look at a few basic water bottle functions, to give you an opportunity to make a decision based on your own individual preferences and needs. The most common materials for a travel pet water bottle to be made with is either plastic or stainless-steel and silicone, and what you want to look for before making a purchase is that the product is BPA free. All items listed here are free of toxins and PBA, as indicated by the manufacturers and affiliated websites. One difference between the two materials is that while stainless-steel is fairly light-weight, plastic will often weigh even less, so if a light-weight dog portable water bottle is important to you-you might be better off with plastic. Stainless-steel, however, tends to keep the water cooler for longer, especially when combined with a silicone cover since it creates an isolating effect. There are no obvious pros or cons to either material, and it all comes down to what you prefer and feel comfortable using. 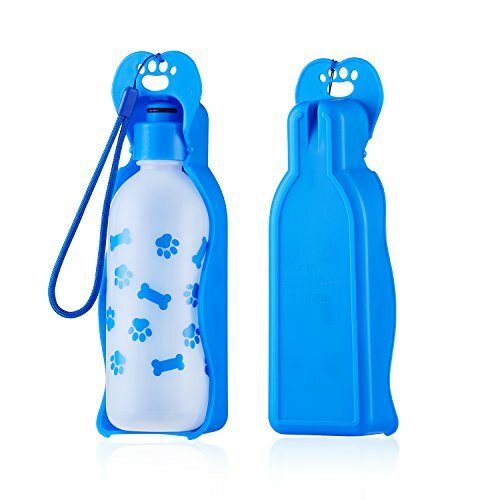 Some dog travel water bowl bottles have a built-in function which allows water to retract back into the portable pet travel bottle from the tray/bowl once the dog is done drinking. This is an excellent feature which ensures that nobody wastes water, meaning it will last longer without having to be refilled. 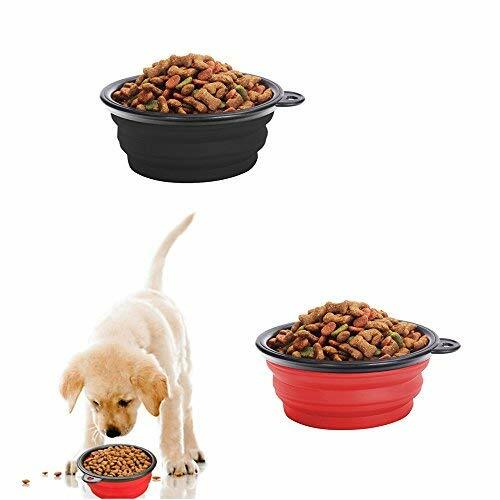 Of course, with other models, you can usually detach the bowl and pour the water back in yourself, but the benefit of a portable dog waterer with this automatic function is that you can do it all with only one hand. Another thing to take into consideration is the holding capacity of the dog water bottle bowl you choose to go with. If you are planning to use them for longer trips or outings – you want to make sure it can hold enough water to last until the next time you can find a place to fill up. If you just plan to use the bottled dog water for quick trips to the park – then yes, a smaller one will probably due. 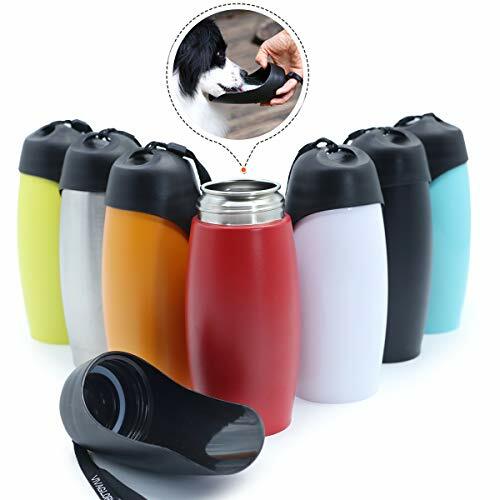 Many products will also have a pet water bowl top that is compatible with other water bottles (the kind you use when doing sports) so that you can purchase a larger pet water bottle later and still use the same dog-friendly lid with pet water bowl. 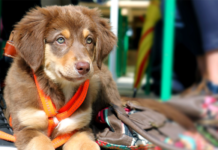 Make sure the dog water carrier is free from toxic materials, big enough to hold enough water for your pup, lightweight and that it has a clip or a strap to easily attach it to a hiking bag, a stroller or a belt. You also want your pet travel water bottles to be easy to clean, as bacteria can otherwise build up inside, and the least thing you want is to get your fur buddy sick! Choose a product that opens with ease to be cleaned on the inside, and preferably one that can also be washed in the dishwasher. 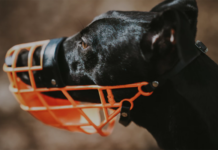 As long as you go for a product with a water bowl type construction, so that your dog can leap up water with his tongue just the way he would from a regular bowl, you should be fine. Dogs are intelligent creatures, and if offered water when thirsty – they will drink. Giving water from a regular water bottle is usually more difficult, since the dog can’t drink in a natural way, so always make sure the portable pet travel bottle has an attached bowl or bring one separately. Many dog travel water dispensers are safe to pop in the dishwasher, but make sure you read the instructions or the product information before you decide to try, just in case it isn’t. 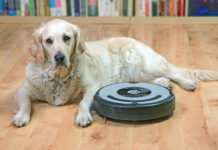 This is by far the easiest products to clean since it requires very little of you as a dog owner. Other products can be washed by hand using a sponge or a brush, depending on how big or small the opening is. Should the travel pet water bottle have a very small opening – an old toothbrush might do the trick! It is important to keep water bottles clean, to make sure your pup stays healthy and strong as well as ready for new adventures! Portable dog water containers aren’t just for those who take their pups for long hikes or other extreme activities, but they can also be great assets for regular walks in the neighborhood or trips to dog parks. 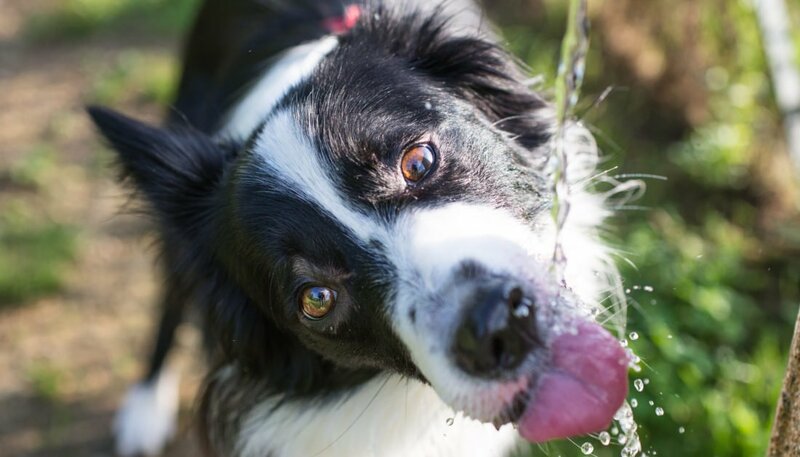 Dehydration is a dangerous condition and something you will want to avoid at all cost, and with the products suggested above you can easily bring water with you for your pooch wherever you go. Make it a habit to always bring your water container with you, whenever you take your dog outside. Dogs can’t ask for water when they are thirsty, so it is a great idea to offer it to them at least once every hour. Bringing your own water also eliminates the need to let your dog drink from public drinking water bowls (in for example dog parks), as these can carry plenty of bacteria. When dogs drink water, they stick their tongue out and form it almost into a cup, which then scoops water back into their mouths. Clever, huh?